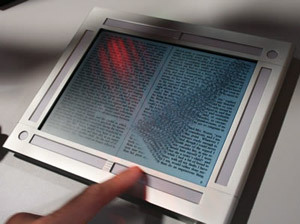 HP presented its new concept for a next generation e-book reader at the 2007 HP Mobility Summit in Shanghai, China. This A4 sized e-book reader has an intuitive interface on which you flip through the virtual pages of the e-book just as you would turn the pages in a real book. There’s also an interesting feature that allows you to read photo books using the HP’s online photo website ‘Snapfish’. The e-book reader runs on Linux using software developed by HP Labs, and has a USB connection to transfer the books. The plan is to use Wi-Fi connectivity on future models. Even though the prototype seems to be functional, HP says that to launch a real product is going to take longer, since they have to research more, develop software and receive feedback from the customers, according to Philip McKinney, HP’s Vice President and CTO (among other ranks). He says that HP has only built a limited number of units for testing. We can only hope that this e-book reader is released sooner than it is planned. Via AVING and Pocket Lint.